We all love biryani - the aroma of fresh spices, the taste of ground masala, and the bewitching look of this one pot meal makes biryani an all-time favorite with you, me, and everyone, isn't it? Perhaps biryani takes inspiration from the Mughals - whose lavish menus could never ignore biryani. My hubby makes delicious biryani - veg and nonveg both. These days we are not eating nonveg, except fish, for reasons galore. A great source of iron for those with iron deficiency, spinach isa healthy addition to your meal planning. 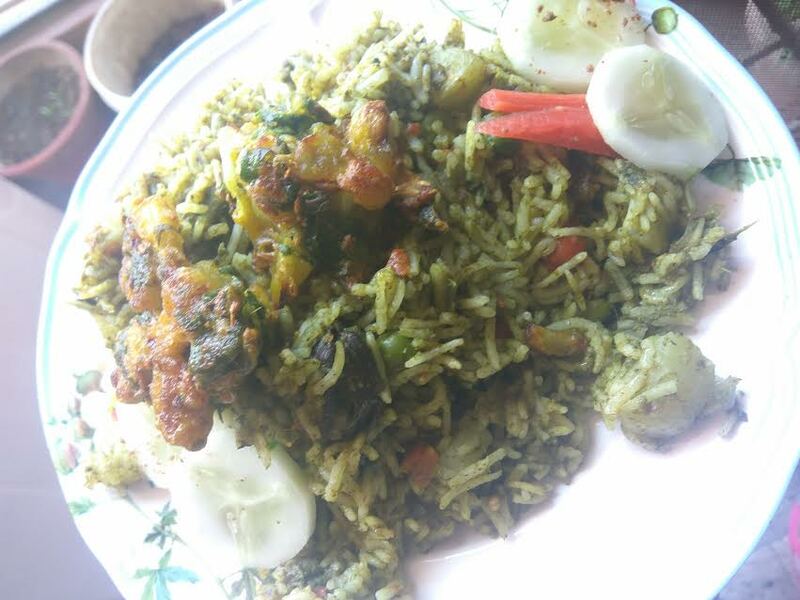 What better way to relish this green beauty than palak biryani, that too, in one pot one shot. If you have sudden guests at home, this OPOS palak biryani recipe can come in handy. 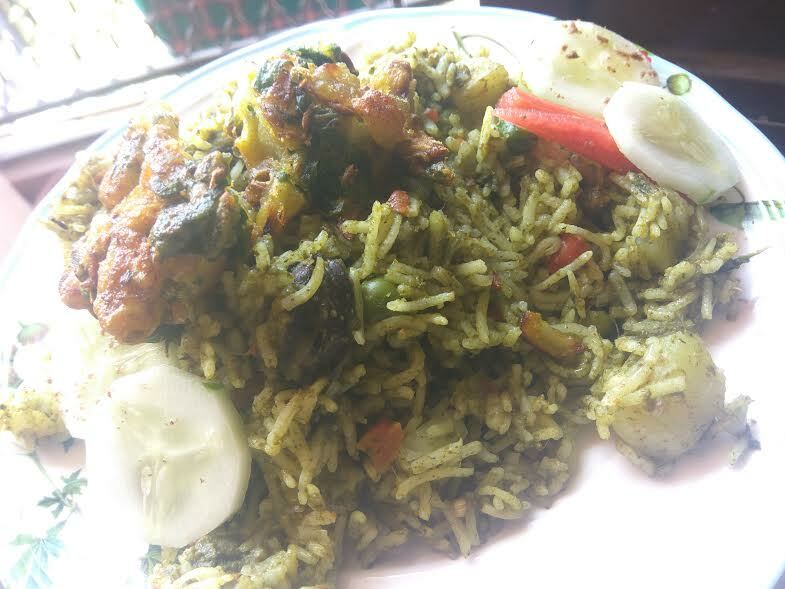 The green color of palak biryani is so tempting, while the aroma of whole spices is sure to tempt taste buds of just about anyone. Chop veggies and marinate them with curd, salt, turmeric, and garam masala. Keep aside. Wash palak leaves thoroughly. Add ginger and garlic along with chopped palak leaves to a mixer grinder and grind everything together. You will get palak puree. Do not add water. Add oil, bay leaf, cinnamon stick, both cardamom pieces, clove..
Add chopped tomato in the center. Then spread a layer of chopped onion around it. Next add a layer of marinated veggies. Keep half of this for the second layer. Add the remaining marinated veggies. Add just 1/4 cup of water since palak puree is already water. I got one and a half cup of palak puree so used 1/2 cup of water, but felt my rice got little sticky. So the idea is to use minimal amount of water. Cover with a lid. Do not mix. Turn on the flame to medium and allow for 3-4 whistles. Allow the pressure to settle down. Open the lid,and mix everything. Close the lid once again until you are ready to serve a delicious palak biryani ready in one pot one shot (OPOS). Do write to me how you find this spinach biryani loaded with fiber, minerals, and iron. Treat your loved ones this weekend with a special menu. Do not be surprised if they ask for more. Do try out my OPOS sambar recipe. 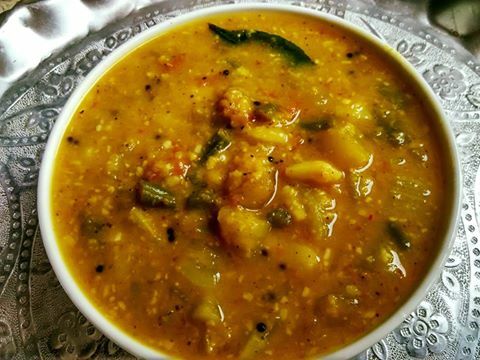 You will instantly become a fan of this 5-min sambar. Thanks to Mr. Rama Krishnan for coming up with OPOS method. It has made life easier for me.I am experimenting with OPOS ever since I came across this revolutionary culinary method. OPOS is no less than magic. 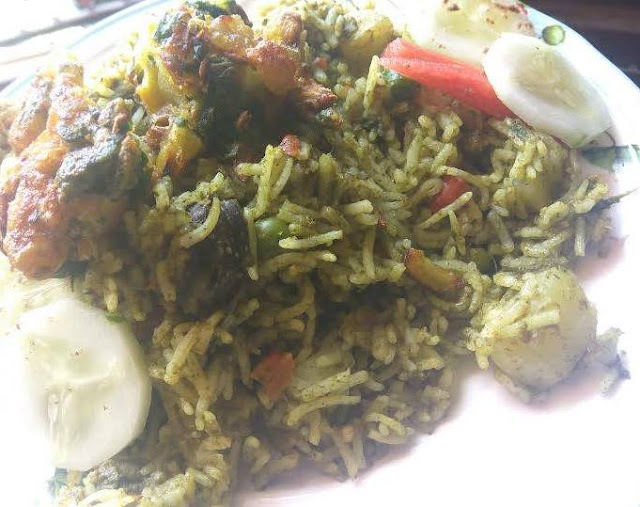 OPOS biryani tastes yummy, looks vibrant, and emanates a mouthwatering aroma.